Why hoard or recycle your old Macs when you could do something useful – but not dangerous – with them? Many Mac models outlast their support, still going strong long after Apple has cut them adrift in terms of both spares supplies and updates to OS X. Rather than consign them to recycling, or filling your loft or storeroom with such museum pieces, you could still find good use for them. Whilst it is perfectly possible to use an old Power Mac G4 as a web server, you should think very carefully about whether that would invite problems. First it can run, at the very latest, Leopard (10.5.8), which has accumulated a worrying list of known vulnerabilities since it was last updated. Once a hacker discovered which OS and web server software it was running, it would quickly be defaced or taken over completely. Unless you want to offer up a honeypot to hackers, you must keep old models running unsupported versions of OS X well sheltered within your firewall. Another major flaw in that plan would be the hit taken by its ageing hardware. Web servers work their hard drives ragged, if they are at all busy, so you would need to replace its drives before putting it into service, making a significant investment in a Mac which could fail irreversibly at any time. Similar concerns would make it unsuitable for use as your main file server for active or massive files, where its limited bus capacity would also make it a performance liability. Ideal applications for older Macs include streaming non-essential media, and maintaining access to beloved ancient applications which are not available for more recent releases of OS X. Plenty of really useful products never made it out of the Classic environment; if you want to run them, you will need to keep a PowerPC-based Mac running Tiger (OS X 10.4), which provides Classic 1.9, as Leopard (10.5) dropped it, and it does not run on Intel-based Macs. You could try an open source emulator such as Basilisk, a 680×0 emulator, or SheepShaver, a Classic emulator, but they are generally not as good or as compatible as a real PowerPC and Classic. Hardware spares tend to become scarcer the older your Mac is. Models released in the last 4-5 years are generally well supported, but as they become ‘vintage’ (which now includes early Intel models up to 2008), some key parts can become almost impossible to obtain. All PowerPC systems apart from the very last Power Mac G5 model are unsupported by Apple, so even specialist spares suppliers such as Mac Upgrades, VIS, and The Bookyard may be unable to offer parts. You would then need to scour eBay or recycling organisations, the computer equivalent of car scrappers, or try the richer spares market in the USA. Of course if you have a handful of working examples of the same ancient model, and some electronics skills, you can cannibalise the many to keep one or two working systems. Hardware service manuals are provided as part of the AppleCare Technician Training package, available from Apple’s online Store for £214 (inc VAT), and others are downloadable from Apple’s support site. Unless there is an overriding requirement to stick with an older release of OS X, you should always try to run the latest supported by your ancient Mac. For PowerPC models this should be Leopard (10.5.8), and Intel models should aim for Snow Leopard (10.6.8) whenever possible; the last security update for Snow Leopard was 2013-004 of 12 September 2013, which does at least limit subsequently discovered vulnerabilities. Could your older Mac run Yosemite? Recent Macs are likely to have been successively upgraded through Mountain Lion to Yosemite. Although not always an easy journey, trying to leap from Snow Leopard or Lion (10.7) to Yosemite can be quite fiddly and fraught. Unless you really cannot run Yosemite, you should not delay upgrading any longer: it will only get more difficult, and more important that you do. The stepping-off point for Yosemite must be at least OS X 10.6.8, with its App Store support, although you will need additional tools, such as Apple’s Migration Assistant Update from its support site, to go from Lion to Yosemite. The Model Identifier, shown in the second line here, helps you specify your Mac exactly. If you are unsure whether your Mac can run Mountain Lion and later, open System Information, and the Hardware Overview will reveal its Model Identifier. Check that against the table below to see whether you are stuck with Lion (10.7), or can move up to 10.8 and beyond. 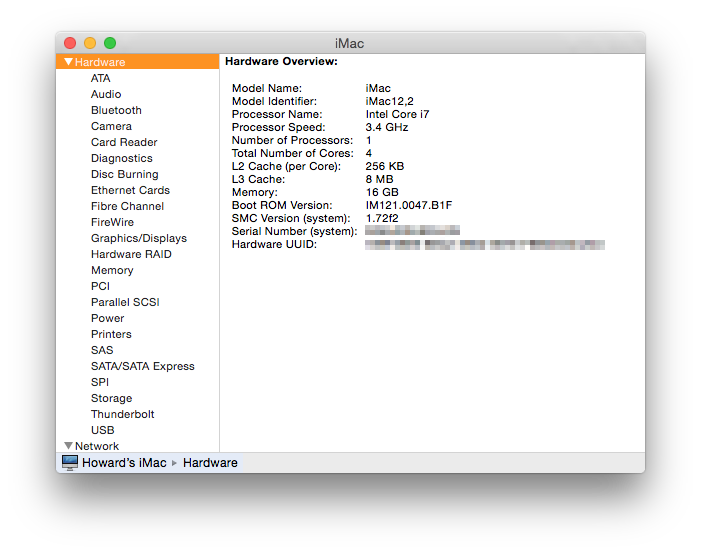 MacTracker provides additional information on OS X capacity, memory expansion, and more. 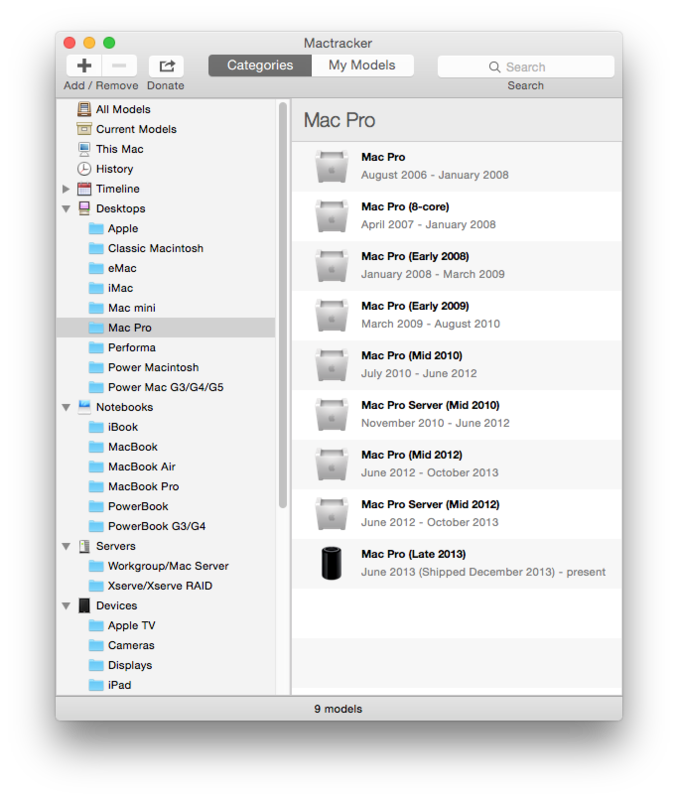 MacTracker contains essential information about every model of Mac, and much more. If you really cannot think of anything better, Apple may offer your store credit against an old Mac through this scheme. If you have to recycle but cannot bear to part with the case, you can consign the innards to a recycler, then repurpose the case; there is a long and glorious history of Mac users turning their old Macs in sculpture, fish tanks, cat baskets, and more. One vital note of caution: iMacs (and any other similar system) containing a CRT ‘tube’ display must be dismantled with great care even months after they have been disconnected from mains power, as the circuits in the display subsystem can retain lethally high voltage. If you don’t know what you are doing, get an expert to discharge the CRT circuitry to ground before going any further. It seems a crying shame to send good old Macs for recycling. Redeployed wisely, you may not need to. Updated from the original, which was published in MacUser volume 30 issue 06, 2014. Posted in Macs, Technology and tagged Leopard, Lion, Mac, OS X, Power Mac, repurpose, Snow Leopard. Bookmark the permalink.